For my previous project a customer required a list of brands (taxonomy vocabulary) that linked to a product. On this product page there would be an overview of products with the same brand and product type (eg. Watches of the brand Rado). So basically the list of tax terms functions as navigation. Since we didn't want to link to the taxonomy term itself but to the product that referenced the term, we had to do some custom coding. The customer didn't specify which product each term would have to link to, so we opted for the latest added product. The product page was created with page manager because we needed different layouts for different product types. And that's where the page manager plugin comes in to play. We're adding this plugin to our custom Dropsolid glue module, which is located at sites/all/modules/custom/, there we have the folder glue_site/ (our module folder). // We'll be nice and limit scandir() calls. This function says that we're making a plugin for ctools, of the type 'content_type'. This way we make sure only the right module gets told about the plugin, and the module knows where to look for it, this also ensures it searches the disk for files only when the right type is provided. By the way: a 'content type' in ctools is a pane, like provided by views for example. We'll also provide a context in page manager, defining which term the product has to be referencing. 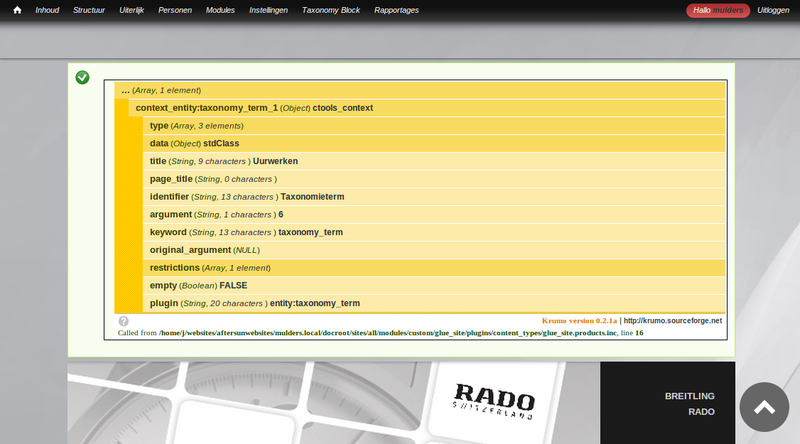 Note: this block(actually a pane) will only be available in page manager, not on the normal blocks page in drupal. Then we declare $block as an stdClass and give it a title, after that we declare the variables we need in the next function. We get $product_type_tid from the context, you can use dsm($context); to find out what you need, then we get $product_type_name from the configuration field in the pane ui. This is an example of using dsm($context); to see what's inside. The comments explain what the EntityFieldQuery does. The last part of the function is some regular php code to basically do whatever you want once you got the results from the query. The next function simply renders our links as a list. With this one we create the form, this can be very basic, but also very powerfull, it allows the user to fill in the required values in the form instead of having to do it in code. * 'Edit form' callback for the content type. // No settings beyond context, which has already been handled. This renders one textfield in the form, you can add as many as you want. * Notice, the magic that automatically does that for you. That's it, spend some time familiarizing with it and before you know you'll have the hang of it. It's not that difficult once you get it and it's very very powerfull.